In case you missed my earlier post about the Brain to Books CyCon, or Cyber Convention, here’s an update and personal invitation to join as a reader or writer. 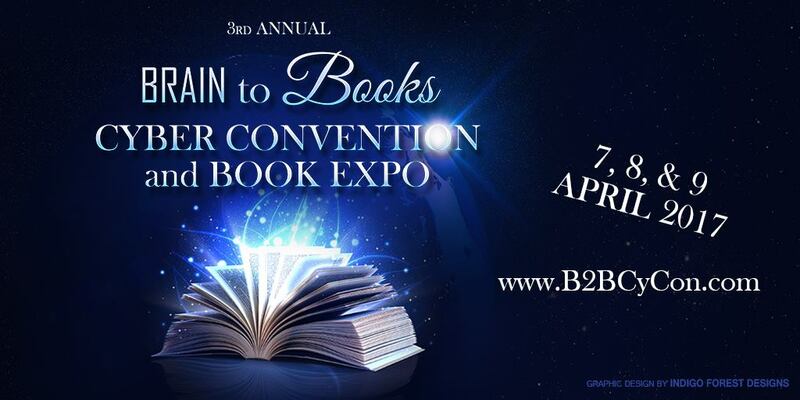 B2BCyCon is a three-day event where authors, vendors, and readers come together to celebrate their love of story. The convention is so big, we need two websites, two support groups, and over 60 volunteers to run it. …Every year, Brain to Books hosts the Annual Cyber Convention and Book Expo. For three days, readers of all genres enjoy blog tours, contests, games, prizes, giveaways, raffles, and so much more. Nearly every event seen at a State Fair can be found at CyCon. The difference? Our fair theme is books! In its third year, B2BCyCon attracts the best new talent and indie publishers from around the globe for 3 days of fun, giveaways, and all the activities you’d find in a traditional fan convention, such as Comic-Con without the huge expense — it’s FREE. Heck, you don’t even have to change out of your ‘jamies and bunny slippers because all the fun takes place online. First, register so you’ll get updates as we get closer to the Con. It’s easy peasy [just enter your name and email address] and FREE. If you enter soon, you can win $100 — so, you’re getting paid to have a great time at the Con. An author showcase where you can interact with the authors and pick up swag like free books, etc. Storytime where you’ll hear excerpts of books. Interviews with the authors to see where the stories come from. There are even traditional con events like costume wars, character cosplay, biker wars, and cover wars. If you’re an author, you can purchase any or all events in the Con starting at $5 for events — and many are free. Promote your books, go to workshops, or enter your book in the contests. Once you register, block off April 7-9, because you’re gonna be busy collecting all the swag and finding new authors and books. Now, invite your friends because everyone knows a Con is better with friends. While you’re enjoying the Brain to Books CyCon, be sure to check out my booth to get a free download of “Buried Ladies”, the first in the Dark Web series, available on Amazon. Then, subscribe to my newsletter to get the inside scoop as Book 2, “Scars from the Past” joins the family.